Buy One, Get One For 99 Cents! (Nature's Wonderland) - Penn Herb Co. Ltd.
"C" Your Way To Antioxidant Immune Support! Vitamin C is more than just a cold season vitamin! The popular antioxidant reinforces immune health, provides powerful anti-stress support, soothes seasonal sensitivities, and plays a role in the formation of collagen, which is important for skin, bone & joint health! 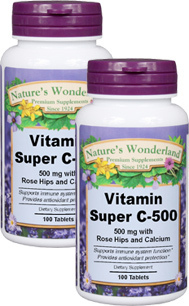 Nature’s Wonderland C-500 is enhanced with Calcium and Rose Hips, one of nature’s most concentrated natural sources of vitamin C and bioflavonoids. "C"what else this super vitamin can do for you. Helps neutralize cell-damaging free radicals; supports immune function; cardiovascular health; promotes tissue repair; supports normal healing process. Supports adrenal function (helps body manage stress); supports formation of collagen (promotes healthy joints, bone & skin); promotes gum health; helps body properly utilize iron. Adults, take 1 tablet daily preferably at meal time.